Firmware updates are more vital than ever, with numerous critical vulnerabilities and backdoors discovered in the past year alone. Keeping firmware updated can mitigate cameras' exposure to outside threats, closing unused ports, improving password security, and patching software vulnerabilities which may allow unauthorized access to your cameras. However, updating firmware can be one of the most tedious tasks involved in any surveillance system. It is not always clear what version is latest, what has changed or been fixed, and where to even download it. To help new users more quickly find new firmware, we've compiled the following list of common IP camera manufacturers, where to find their firmware, estimated time to upgrade, and our notes on these upgrades. Faster updates: In 2014, several manufacturers' firmware updates took longer than 5 minutes, with the longest near 15 minutes. Now, every manufacturer tested completes updates in 5 minutes or less. 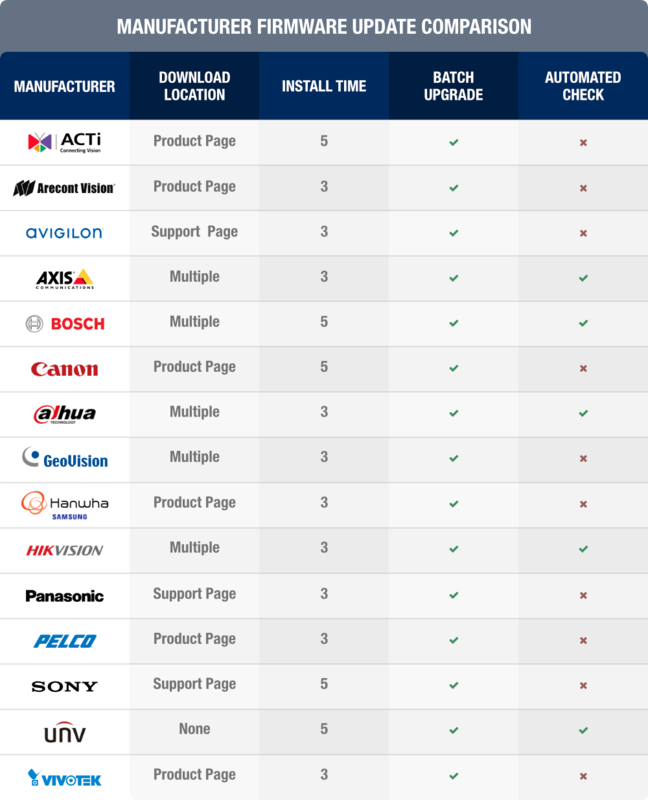 Better firmware availability: Every manufacturer listed makes firmware publicly available. In the cases which require logins (such as Axis or Arecont), these accounts may be created by anyone, not only partners. Previously, some firmware updates were available only to partners or users needed to contact tech support for downloads, making the process more frustrating. Automated checks increasingly common: In 2014, few manufacturers included mechanisms for one-click or fully automated checks for firmware updates. Now, an increasing number include this feature, such as Axis (via Device Manager), Bosch, Dahua, and Uniview. See our report Pros and Cons - Automating Firmware Updates for more discussion and details. ACTI firmware can be found on the Download Center of ACTI's website or the specific product page of the camera. ACTi camera firmware is updated via the camera's web interface. Batch firmware upgrades can be carried out utilizing ACTi's IP Utility 4. Download location: Firmware is available on each camera's product page or the Download Center on ACTI's website. Batch upgrade: Yes, using ACTi IP Utility 4. Arecont cameras may be upgraded either via the camera's web interface or their AV IP Utility. Download location: Firmware is available on each camera's product page as well as the support downloads page. Avigilon Control Center automatically updates camera firmware when the camera is added to the VMS. It may be manually updated via ACC options, as well. For those not using Avigilon Control Center, firmware is updated via the camera web interface. Download location: Firmware is available on each camera's product documentation page as well as the downloads section of their tech support page. Axis cameras may be updated via Axis Device Manager, one at a time or in batch, or via the web interface. Download Location: Axis website under "Support" and then "Firmware" or on each camera's product page. Bosch IP cameras may be upgraded by using the "check" button in the camera's web interface, which automatically connects to their servers to compare the camera's current firmware version to the newest available. If a new version is available, a download link and instructions are presented to the user so it may be easily installed, an example is given below. Alternately, firmware may be manually upgraded in batches using Bosch Configuration Manager. Download location: In camera web UI under the "Maintenance" tab. Canon firmware updates can now be found on individual product pages of the Axis web site, under Canon cameras. Dahua firmware can be found at the Dahua Wiki for US customers and for other regions, firmware is available on the users region-specific website. Firmware is then upgraded via the camera's web interface or the ConfigTool. Recently Dahua implemented an optional firmware check in their web interface to make sure firmware is up-to-date, a user must opt-out if they would not like the camera to auto-check for updates, below is an example. Download location: Dahua Wiki in the Firmware Search Tool for US users and the region-specific Dahua website for other regions. Geovision camera firmware is updated via the camera's web interface. Batch upgrades can be performed with Geovision's IP Device Utility. Hanwha firmware can be found in the specified Camera product page or searched for on Hanwha Device Manage. Hanwha / Samsung firmware is updated in either the camera's web interface or with the Hanwha Device Manager. Download location: Camera product page, under "firmware"
Batch upgrade: Yes, using Hanwha Device Manager. The most up-to-date Firmware for Hikvision cameras can be found on each region's website, e.g., the the US Tech Portal or Europe Tech Portal. Batch firmware upgrades can be done via the Batch Configuration Tool. Hikvision has recently added an update button to their web interface. However, this button is currently not working, and simply tells users that no new version exists, which may mislead users into thinking that they have the latest firmware, despite being out of date. Hikvision tells us that it is planned for future use, shown below. Download location: U.S. Tech Portal for U.S. customers and the Europe Download Portal for other regions. Panasonic camera firmware is updated via the camera's web interface. Batch firmware upgrades can be completed using the Panasonic Security System Configuration Tool. Download location: Panasonic download page. Batch upgrade: Yes, using Panasonic Security System Configuration Tool. Pelco cameras are updated via the camera's web interface or with the Pelco Device Utility Software. Pelco firmware can be found on the Pelco website under the camera specific page in a drop-down menu. Download location: Camera product page in the drop-down menu. Batch upgrade: Yes, using the Pelco Device Utility Software. Sony firmware is updated using SNC Toolbox, which allows for batch upgrades. Downloads are found on the resources page of the Sony Security website. Batch upgrade: Yes, using Sony SNC Toolbox. Uniview firmware is not publicly available for download, but can be updated via the "Cloud Upgrade" button in the web interface as long as the camera is connected to the internet. Batch cloud upgrades can be performed via the EZtools software. Download location: Firmware is not publicly available for download, but may be downloaded via the cloud in the camera's web interface. Vivotek firmware can be found on camera product pages under the "Downloads" tab. Firmware can also be found by using Vivotek's downloads page and choosing "firmware" and a camera model. Batch upgrades can be done via the Vivotek Shepherd software. Download location: Camera product pages, under "Downloads", and Vivotek's Downloads page. Batch upgrade: Yes, using Vivotek's Shepherd software. When cameras are working without issue, users see little reason to update firmware. Their system has worked without the update and potential features or fixes it contains, so why update? There is also a general perception that updating firmware may break integrations with VMSes, further reason not to upgrade. On the other side are those who keep cameras updated as a matter of course. Manufacturers update firmware with bug fixes and features. Even if these updates are not specific to their system, they may provide performance gains and features the would utilize if available. Additionally, these updates may contain security fixes for known or undiscovered vulnerabilities. Poll: When Do You Update? Do you have strong feelings on firmware updates either way? Take this poll and tell us why in the comments. I think another fair question is how many times have you had to roll back to a previous firmware because the camera stopped working with the VMS. I have had to do that before. I always recommend turning off automatic updates on the firmware for cameras and Windows for the server. I don't see the Windows update issues anymore though so maybe it isn't as big of an issue as it once was. The spreadsheet has been updated to confirm that ACTi and Dahua both allow for batch firmware upgrades. Please let us know if there are other manufacturers you would like us to add, and we will incorporate them into this directory. An issue I am running into is with a VMS supporting the latest firmware. Many times you have to roll back or downgrade to a different version. When this happens there is little to no support online for us to download older firmware. What would be helpful is add a site for downloading older firmware if there is one available and include it in your list.